Over 45 cars registered to show, lining up to be seen by the crowd and enjoyed. Drivers on Jackson Pike Saturday afternoon likely saw large clouds of white smoke rising from the fairgrounds. Nothing was on fire, but tires were certainly being roasted. Brian Hoffman produced plenty of tire smoke in his purple Chevy Camaro. 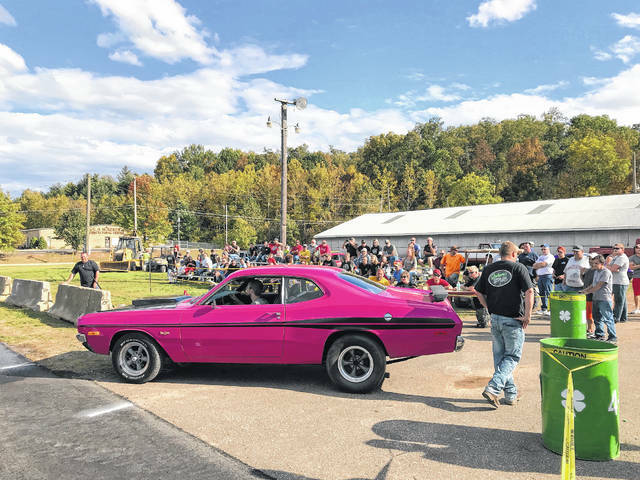 Michael Stapleton won the burnout contest in his pink Dodge Demon, pleasing the crowd with plenty of tire smoke. 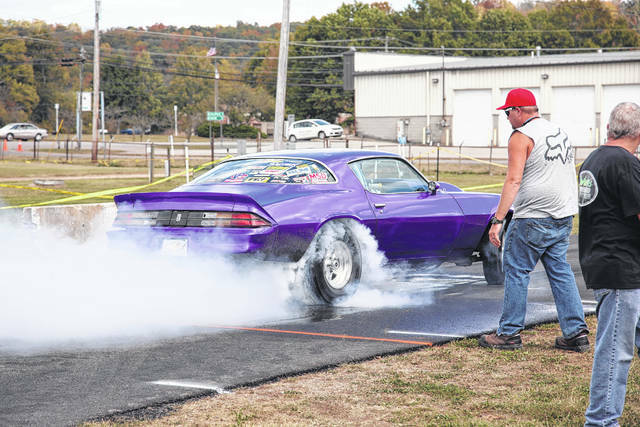 GALLIPOLIS — Large clouds of white smoke rose over Jackson Pike Saturday afternoon as local car enthusiasts did burnouts to please the crowd and the public. This past Saturday was the inaugural French 500 Car Show and Swap Meet, a new way to promote the fairgrounds and raise funds for the relocation fund. 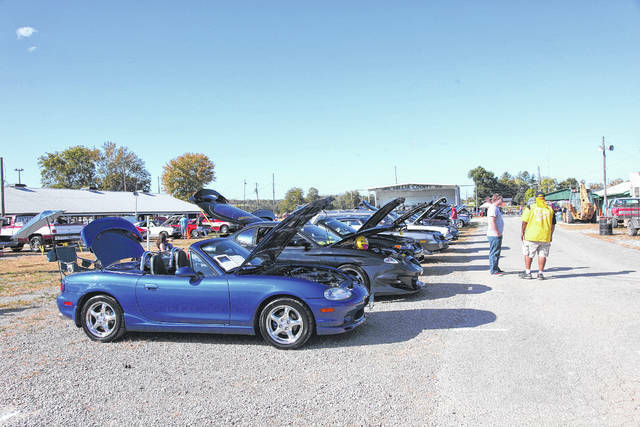 The car show had over 45 cars registered from Mason and Gallia County, with trophies going out to the top 25 in judging. Smith Chevrolet donated a $200 cash prize to the top spot in the car show, going to Bill Ward and his 1967 corvette. At 3:30 p.m. several cars lined up for a burnout contest, judged by the fans in the stands. Contestants pulled their car onto a fresh patch of blacktop and each one spun their tires creating as big a cloud of smoke as they could. A tie was determined between Wes Smith and Michael Stapleton, both of Gallia County for their large clouds, and the crowd decided that they had to go again to determine a winner. Stapleton was awarded to top spot in the burnout contest, with Smith coming in second place. Norris Northup dodge sponsored the $200 prize for first place. Door prizes were awarded every 30 minutes for the duration of the show, with support from numerous vendors and local businesses. Over $1,800 in prizes was given away. Graham’s Towing and Auto Repair and Napa of Gallipolis are the main sponsors, coordinating the event.